Aimed at users such as smallholdings, dairy units, sportsturf managers, horse yards and specialist crop growers requiring easy-to-operate low-horsepower machines with simple specification and competitive pricing. 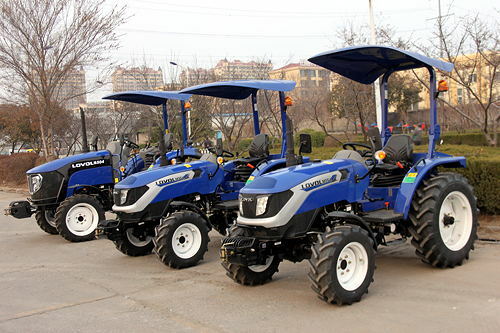 The 25, 35 and 50hp models, imported and supported by Kent business Foton Tractors and previously sold under Foton branding, will now wear the Lovol name of Foton’s parent company, following the decision of the manufacturer to restructure its branding and focus the Foton brand on the trucks it also builds. The UK importer says that, while the new name will not affect the established service and support systems it provides, a new generation of upgraded tractors will wear the rebranded livery of the restyled machines. Model numbers stay the same, and as before the 25hp M254 is a three-cylinder machine, while the 35hp M354 and 50hp M504 are four-cylinder tractors. All meet the latest Stage 3A emissions regulations currently required in this power bracket, come standard with four-wheel drive and are available with either a roll bar or cab. Key upgrade on the new Lovol M254 and Lovol M354 models is a four-speed, two-range synchromesh transmission with side-mounted levers, replacing the former constant mesh unit with central straddle-type transmission tunnel, and thereby creating a flat-floor platform. A synchro-shuttle lever is sited on the dashboard to the left of the steering column. Built on a larger platform, the M504 also now has side-mounted gear levers, but benefits from an additional speed range to create a 12 forward/12 reverse synchromesh transmission, again with synchro-shuttle. Like the smaller tractors, it benefits from a new cab designed by Lovol’s European technical team, incorporating side console controls, upgraded air conditioning, improved seating and full steering wheel adjustment. It measures 1.65m wide and, in cabbed format, is just over 2.5m high. Power take-off engagement is eased with a new electro-hydraulic switch, and radial rather than cross-ply tyres are now fitted for improved traction. A new front axle design for the M254 and M354 provides greater ground clearance and is more robust. At the rear, the Category I three-point linkage on the M254 and M354 lifts a maximum 720kg, while the figure for the M504 is 910kg. All models are fitted with two spool valves and a 540/1,000rpm power take-off. The tractors also meet the EU ‘Tractor Mother Regulations’ (TMR), designed to enhance operator, environmental and road safety. To this end, they incorporate features such as double external mirrors on each side, dual-line hydraulic trailer brakes, key-secured bonnets and automatic PTO disengagement when the operator leaves the seat. “The M254 and M354 tractors have been our main sellers here in the UK, and there remain a number of Generation 2 models available for a time yet, for those happy to trade off a lower price against the older specification,” says Tom Curtis, of importer Foton Tractors UK. “But the new Generation 3 M-series models with improved specification are available to order now, and there are no more Generation 2 models of the M504 available – this tractor is now only available with the new Generation 3 specification. With the UK importer having been selling the manufacturer’s tractors for over a decade now, a park of around 900 units is now reckoned to have been retailed here, calculates Mr Curtis. “While, in recent years, we have retailed between 60 and 80 units a year, our aim is to double this to in the region of 120-150. To do that, while until now we have sold and supported tractors all over the UK – and will continue to do so – we have begun over the past three years to appoint sales/service agents, and this year have signed our first dealers. “We are now the exclusive importer of Lovol tractors for the UK, giving us access to machines made in what is calculated to be the biggest tractor plant in Asia. Located in the city of Weifang, in the eastern Chinese province of Shandong, it covers 100,000 square metres and has a daily output of 130 units. “To support the new machines, we have increased the parts stocks we hold to encompass around £30,000-worth of common spares, and our system allows us to obtain any less-common parts within 5-7 days. “The resources behind Lovol – which is a company with 15,000 employees and assets of £1.79bn – means we and the products we sell are very well-supported, which in turn means we are able to provide users with the best possible service.